Torrential flows like debris flows or debris floods are fast movements formed by a mix of water and different amounts of unsorted solid material. They generally occur in steep torrents and pose high risk in mountainous areas. Rainfall is their most common triggering factor and the analysis of the critical rainfall conditions is a fundamental research task. Due to their wide use in warning systems, rainfall thresholds for the triggering of torrential flows are an important outcome of such analysis and are empirically derived using data from past events. In 2009, a monitoring system was installed in the Rebaixader catchment, Central Pyrenees (Spain). Since then, rainfall data of 25 torrential flows (“TRIG rainfalls”) were recorded, with a 5-min sampling frequency. Other 142 rainfalls that did not trigger torrential flows (“NonTRIG rainfalls”) were also collected and analyzed. The goal of this work was threefold: (i) characterize rainfall episodes in the Rebaixader catchment and compare rainfall data that triggered torrential flows and others that did not; (ii) define and test Intensity–Duration (ID) thresholds using rainfall data measured inside the catchment by with different techniques; (iii) analyze how the criterion used for defining the rainfall duration and the spatial variability of rainfall influences the value obtained for the thresholds. The statistical analysis of the rainfall characteristics showed that the parameters that discriminate better the TRIG and NonTRIG rainfalls are the rainfall intensities, the mean rainfall and the total rainfall amount. The antecedent rainfall was not significantly different between TRIG and NonTRIG rainfalls, as it can be expected when the source material is very pervious (a sandy glacial soil in the study site). Thresholds were derived from data collected at one rain gauge located inside the catchment. Two different methods were applied to calculate the duration and intensity of rainfall: (i) using total duration, Dtot, and mean intensity, Imean, of the rainfall event, and (ii) using floating durations, D, and intensities, Ifl, based on the maximum values over floating periods of different duration. The resulting thresholds are considerably different (Imean = 6.20 Dtot-0.36 and Ifl_90% = 5.49 D-0.75, respectively) showing a strong dependence on the applied methodology. On the other hand, the definition of the thresholds is affected by several types of uncertainties. Data from both rain gauges and weather radar were used to analyze the uncertainty associated with the spatial variability of the triggering rainfalls. The analysis indicates that the precipitation recorded by the nearby rain gauges can introduce major uncertainties, especially for convective summer storms. Thus, incorporating radar rainfall can significantly improve the accuracy of the measured triggering rainfall. Finally, thresholds were also derived according to three different criteria for the definition of the duration of the triggering rainfall: (i) the duration until the peak intensity, (ii) the duration until the end of the rainfall; and, (iii) the duration until the trigger of the torrential flow. An important contribution of this work is the assessment of the threshold relationships obtained using the third definition of duration. Moreover, important differences are observed in the obtained thresholds, showing that ID relationships are significantly dependent on the applied methodology. Abancó, C., Hurlimann, M., Moya, J., Berenguer, M. Critical rainfall conditions for the initiation of torrential flows: results from the Rebaixader catchment (Central Pyrenees). 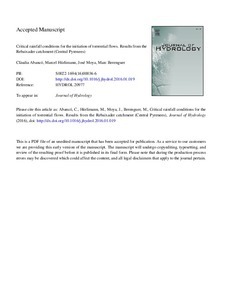 "Journal of hydrology", Octubre 2016, vol. 541, part A, p. 218-229.